Specific phobia is a type of disorder in which the affected individual displays a marked and enduring fear of specific situations or objects. Individuals with specific phobias experience extreme fear as soon as they encounter a defined situation or object, a phobic stimulus. For example, an individual with a specific phobia of dogs will become anxious when coerced to confront a dog. The specific phobia triggers a lot of distress or significantly impairs an affected individual. Mental health professionals use the Diagnostic and Statistical Manual of Mental Disorders (the DSM ) to diagnose mental disorders. The 2000 edition of this manual (the Fourth Edition Text Revision, also called the DSM-IV-TR ) classifies specific phobia as a type of anxiety disorder. Formerly, specific phobia was known as simple phobia. In the last few years, mental health professionals have paid more attention to specific phobias. Specific phobia has a unique position among the anxiety disorders in that individuals with this disorder do not experience pervasive anxiety nor do they seek treatment as readily as individuals with other anxiety disorders. Unlike individuals with other anxiety disorders, the fear of individuals with specific phobias is limited to defined situations or objects. Individuals with specific phobias experience impairment or a significant amount of anguish. They may lead restricted lifestyles depending upon the phobia type. Adults and adolescents with specific phobias recognize that their fear is unreasonable. Children, on the other hand, may not recognize that their fear of the phobic stimulus is unreasonable or extreme. The types of specific phobias include situational, object, and other. The situational type is diagnosed if an individual's fear is cued by a defined situation. Examples include situations such as flying, enclosed places, tunnels, driving, bridges, elevators, or public transportation. Object types include animal, natural environment, and blood-injection-injury types. Animal type is diagnosed if an individual's fear is cued by animals or insects. Natural environment type is diagnosed if an individual's fear is cued by storms, water, or heights. Blood-injection-injury type is diagnosed if an individual's fear is cued by seeing an injury or blood or by an injection or other invasive medical treatment. Other type is diagnosed if an individual's fear is cued by other stimuli such as fears of vomiting, choking, becoming ill, and falling down if far from a means of physical support, and a child's fears of loud noises or characters in costumes. Researchers have found that the frequency of type for adults in clinical settings, from least to most frequent, is: animal, blood-injection-injury, natural environment, and situational. The most common phobias for community samples, however, include phobias of heights, mice, spiders, and insects. The development of a specific phobia may be determined by a variety of factors. Behavioral, cognitive, and social theories of learning and conditioning, psychodynamic models such as the psychoanalytic theory of Freud, physiological studies of the brain , family background and genetic predisposition, variations in sociocultural themes, and theories on trauma can influence the development of specific phobia disorder. Some theorists propose that biological researchers have ignored specific phobias because pharmacological treatment is not the treatment of choice for this disorder. LEARNING AND CONDITIONING CAUSES. 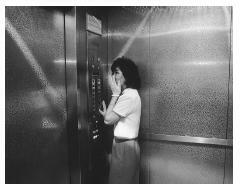 As of 2002, research on phobias focuses on information-processing, learning, and conditioning themes. Learning to experience fear is the core of a conditioning perspective. Informational and instructional factors can result in the formation of fears. For example, an individual who frequently hears of plane crashes in the news may develop a specific phobia of flying. Research shows that individuals with specific phobias pay more attention to information about danger than do individuals who do not have specific phobias. Vicarious acquisition occurs when an individual witnesses a traumatic event or sees another individual behave with fear when confronting a phobic stimulus. Direct conditioning occurs when an individual is frightened by a phobic stimulus. A major determinant of specific phobias is conditioning. Association and avoidance are types of conditioning. In association conditioning, a stimulus that was initially neutral begins to trigger an anxiety response. For example, if an individual was driving one day and experienced a strong anxiety response, an association may form between driving and anxiety. Individuals do not learn to become phobic until they begin to avoid. In avoidance conditioning, individuals learn to avoid a stimulus that triggers anxiety. Every time individuals avoid the phobic stimulus—driving, for example—they are rewarded by the relief from anxiety. TRAUMATIC CAUSES. A determinant of specific phobias includes traumas. For example, individuals who have been attacked by a dog may develop a specific phobia disorder and become conditioned to fear dogs. Individuals who observe others experiencing a trauma (the others are "modeling" behavior for the individual who will be affected) may become predisposed to developing specific phobia disorder. For example, individuals who witness people falling from a building may develop a specific phobia disorder. Phobias with a traumatic origin may develop acutely, or, in other words, have a more sudden onset than other phobias that develop more gradually. PSYCHODYNAMIC CAUSES. Psychodynamic theorists explain that phobias emerge because individuals have impulses that are unacceptable, and they repress these impulses. More specifically, Freud proposed that phobias emerge because of an unresolved oedipal conflict. According to Freud's theory, an oedipal conflict is a developmental conflict that emerges during the third (or oedipal) stage of Freud's psychosexual development stages. During this stage, a conflict emerges with regard to the triad of father, mother, and child. The conflict concerns the sexual impulses that the child has toward the parent of the opposite gender and the hostile impulses that the child has towards the parent of the same gender. During this stage, the developmental conflict concerns a resolution of oedipal issues. Psychoanalysts propose that when repression does not work, individuals with phobias displace their anxiety connected to the unresolved oedipal conflict upon a situation or object that is less relevant. The feared situation or object symbolizes the source of the conflict. For example, a specific phobia may be connected to an individual's conflict about aggressive or sexual thoughts and feelings. In one sense, a phobia protects individuals from realizing their emotional issues. The case of Hans, a boy with a horse phobia, is Freud's paradigm example of a phobia. Freud attributed Hans' fear of horses to an oedipal conflict that was not resolved, and he explained that Hans repressed his sexual feelings for his mother and his wish that his father would die. Freud proposed that Hans feared that his father would discover his wish, repressed his wish to attack his father, and displaced his fear of his father's aggression onto horses. The young boy resolved the conflict of loving and hating his father by hating horses rather than admitting that he had aggressive feelings towards his father. Hans was better able to avoid the feared horses than his father. Thus, the phobia in the case of Hans represents a compromise of intrapsychic movement. PHYSIOLOGICAL CAUSES. Some research has suggested that the high activation of brain pathways that correspond to the cognitive and emotional constituents of anxiety biologically predispose individuals to specific phobias. GENETIC AND FAMILY CAUSES. Although specific phobia is frequently attributed to environmental issues such as modeling , learning by association, and negative reinforcement , genetic predisposition can influence this disorder. An individual who has a family member with a specific phobia is at an increased risk for developing this disorder. Some research indicates that the pattern of types are similar within families. For example, a first-degree biological relative of individuals with a situational type is likely to have phobias of situations. Studies indicate that the blood and injury phobias have strong familial patterns. SOCIOCULTURAL CAUSES. There is a paucity of information about cultural differences in specific phobias. Phobia content may vary by culture. Fear of a phobic stimulus such as magic or spirits, present in several cultures, is diagnosed as a specific phobia only if the fear is excessive for a particular culture and if the fear triggers major distress or interferes with functioning. Some research indicates that African Americans are more likely than whites to report specific phobias. Some studies show that specific phobias are less common among whites born in the U.S. or immigrant Mexican-Americans than among Mexican-Americans born in the U.S. Research suggests mixed data with regard to socioeconomic level, with some data associating specific phobia disorder with a lower socioeconomic level. PERSONAL VARIABLES. Studies suggest a relationship between age and specific phobia. Research indicates some connections between the age of individuals with specific phobias and insight into the extreme quality of their fears. Insight increases with age. Children, unlike adults and adolescents, often do not report feelings of distress about having phobias. Insight into the unreasonable nature of the fear is not required for a diagnosis of specific phobia in children. The animal and natural environment types of specific phobia are common and generally transitory in children. Some studies indicate a connection between gender and specific phobia. Research shows that specific phobias from the animal type are more common among women. Some studies suggest that women are more likely to report specific phobias and to seek treatment than men. Significant and enduring fear of phobic stimulus: Patients with specific phobia display marked and enduring fear when they encounter a defined situation or object, the phobic stimulus. Anxiety response to phobic stimulus: Patients with specific phobia display anxiety as soon as they confront the phobic stimulus. When they confront the phobic stimulus, a defined situation or object, patients with specific phobia may experience a panic attack related to the specific situation. Children may cry, cling, freeze, or display tantrums when they express their anxiety in the face of the phobic stimulus. Recognition: Although adolescents and adults realize that their fear is unreasonable and disproportionate to the situation, children may not recognize that their fear is excessive. Avoidance: Individuals with specific phobia avoid the phobic stimulus or endure it with deep distress and anxiety. Impairment and distress: Individuals with specific phobia display avoidance, distress, and anxious anticipation when they encounter the phobic stimulus. Their avoidance reactions interfere with their daily functioning, or they express significant distress about having a phobia. Duration: To diagnose specific phobia in a patient who is under 18 years of age, the duration of the disorder needs to be at least six months. Not accounted for by another disorder: A diagnosis of specific phobia is assigned if the phobic avoidance, panic attacks, or anxiety related to the defined situation or object are not better accounted for by other disorders. Specific phobias are common. The prevalence rates of specific phobia in community samples range from 4% to 8%. Over the course of a lifetime, the prevalence estimates in community samples range from 7.2% to 11.3%. Individuals whose family members have specific phobia are at a higher risk for developing this disorder. Prior to assigning a diagnosis of specific phobia, clinicians need to consider whether a patient's fear is extreme in the context of a particular culture and whether the phobia causes difficulties in daily functioning or triggers a lot of distress. Further research is needed on the effects of culture upon the symptoms of specific phobia. There are twice as many women with specific phobia than there are men with this disorder. The gender ratio variable varies depending upon the type of specific phobia. Approximately 75%–90% of people with the animal, situational, and natural environment types are female. Approximately 55%–70% of people with the blood-injection-injury subtype are female. For height phobias, there are fewer women than men than for other specific phobia types; however, illness phobias are more common in men. The diagnosis of specific phobia is complicated by factors such as degree of impairment and differential diagnosis. Although fears of specified situations or objects are common, a diagnosis of specific phobia relies on the degree of sufficient impairment. With regard to differentiating specific phobia types, factors such as the focus of fear and the predictability and timing of the reaction to the phobic stimulus across the specific phobia types can assist clinicians to differentiate. With regard to differentiating specific phobia from other disorders, there are several disorders with similar symptoms. They include panic disorder with agoraphobia , social phobia , post-traumatic stress disorder , obsessive-compulsive disorder , hypochondriasis , schizophrenia , delusional, and other psychotic disorders. Generally, a diagnosis of specific phobia rather than panic disorder is made when there are no spontaneous panic attacks and no fear of panic attacks. It is often difficult to differentiate specific phobia, situational type, from panic disorder with agoraphobia. Specific phobia, situational type, is commonly diagnosed when an individual displays situational avoidance without unexpected and recurrent panic attacks. On the other hand, panic disorder with agoraphobia is diagnosed if an individual experiences an initial onset of panic attacks that are not anticipated and subsequently experiences avoidance of several situations considered triggers of panic attacks. Although individuals with specific phobia, unlike individuals with panic disorder with agoraphobia, do not display enduring anxiety, anxious anticipation may occur when confrontation with a phobic stimulus is more likely to occur. DSM-IV-TR outlines differentiating factors as the type and number of panic attacks, the number of avoided contexts, and the focus of the fear. At times, both diagnoses, specific phobia and panic disorder with agoraphobia, need to be assigned. This woman suffers from claustrophobia— the fear of enclosed spaces. as the Anxiety Disorders Interview Schedule for DSM-IV (ADIS-IV) and the Structured Clinical Interview for DSM-IV Axis I Disorders (SCID-IV). To assist in differential diagnosis between specific phobias and other disorders with similar characteristics, clinicians use the Anxiety Disorders Interview Schedule for DSM-IV (ADIS-IV). Physiological evaluations usually include heart rate monitors. Self-report questionnaires include measures such as the SUDS (subjective units of discomfort/distress scale), the most frequently used self-report measure, the Fear Survey Schedule (FSS-III), and the Mutilation Questionnaire, specifically for measuring fear of the blood type of specific phobia. Generally, the initial symptoms of specific phobia occur when an individual is a child or a young adolescent. The type of phobia determines the age of onset. The blood, animal, and natural environment types begin when an individual is a child; however, many new cases of the natural environment type occur when an individual is a young adult. The onset for the height type begins in adolescence. The onset age for the situational type occurs in childhood, but peaks again in the mid-twenties. There is no specific onset age for phobias with a traumatic origin. Classification systems distinguish between individuals with different types of specific phobias. The types of specific phobia, situation, object, and other, relate to particular features such as the age, gender, and culture of an individual. Some researchers propose that to distinguish individual differences in treatment planning, it is more helpful to simply name the specific phobia rather than to use the type classification system. For example, researchers have found that for the animal type, some animals such as a tiger or a bear did not trigger disgust for tiger-phobic or bear-phobic individuals, but other animals such as a spider triggered disgust for some spider phobic individuals, but did not trigger disgust for other spider phobic individuals. Specific phobia often occurs with other disorders of mood and anxiety, and with substance-related disorders. When specific phobias occur with other disorders in clinical contexts, the primary diagnosis is associated with greater distress than is the specific phobia. The blood-injury-injection type of specific phobia may occur with physical symptoms such as vasovagal fainting. The vasovagal fainting response is characterized by a short heart rate acceleration and blood pressure elevation. Then, the heart rate decelerates and the blood pressure drops. Research shows that individuals who have one specific phobia type are more likely to have other phobias of the same type. Specific phobias are highly treatable. They are most effectively treated by psychological rather than biological treatments. The primary goal of most treatments of specific phobias is to reduce fear, phobic avoidance, impairment, and distress. Approximately 12%–30% seek treatment for specific phobias. Cognitive-behavioral therapy has been effective in treating specific phobias. There has not been much research on the effects of cognitive therapy alone on specific phobias. Cognitive therapists challenge fearful thoughts and replace them with more positive thoughts. Although some studies show benefits in that cognitive therapy may assist patients to decrease anxiety related to their exposure exercises, research indicates that cognitive therapy alone is probably not an effective treatment for specific phobia. Researchers suggest adding panic management strategies such as cognitive restructuring to assist with behavioral treatments. Several studies indicate that real-life (in vivo) desensitization or exposure is the most effective and long-lasting treatment for a broad range of specific phobias. Systematic desensitization includes a process by which individuals unlearn the association between the phobic stimulus and anxiety. Incremental exposure involves the patient's gradual facing of the phobic stimulus through a series of graded steps. Wolpe's imagery desensitization is suggested so that patients with specific phobias can face the fear in imagery prior to attempting in vivo exposure. Unlike many of the other treatments, the treatment gains of in vivo exposure are maintained upon follow-up. Some desensitization treatments employ flooding as a useful strategy. When flooding is used, patients maintain a high anxiety level without retreating. Similar to desensitization, flooding can be used both in imagination and in vivo. Flooding is not suggested for most individuals because it can trigger a higher level of sensitization and fear reinforcement. For in vivo treatment, a patient needs to be highly motivated because the treatment may lead to temporary discomfort. The primary reasons for poor compliance with cognitive-behavioral treatment include lack of time, anxiety, and low motivation. Psychodynamic psychotherapy , or insight-oriented therapy assists patients to become more aware of the symbolic nature of their anxiety and to explore traumatic past events. Insight-oriented therapy is a psychodynamic therapy that aims to expose and reduce patients' unconscious conflicts, increase patients' understanding of their underlying thoughts, and assist patients to gain conscious control over their psychological conflicts. In psychodynamic therapy, for example, patients may discover that their anxiety may be connected to aggressive or sexual feelings and thoughts. There is little research on group therapy for specific phobia disorder. Some studies suggest that group treatment has been effective for dental and spider phobias. There has been a paucity of research on the relationship between medication and specific phobia. Generally, pharmacotherapy has not been considered to be a treatment of choice for individuals with specific phobias. Benzodiazepines, however, (medications that slow the central nervous system to ease nervousness and tension) may decrease anticipatory anxiety prior to an individual's entrance into a phobic situation. A low dose of a benzodiazepine such as clonazepam (Klonopin) or alprazolam (Xanax) is indicated to decrease some fear arousal prior to in vivo exposure. The reduction of symptoms, however, may interfere with the treatment. Prior to beginning in vivo exposure, an antidepressant such as sertraline (Zoloft) or paroxetine (Paxil) is suggested to increase motivation for undertaking an uncomfortable treatment. Beta blockers can assist individuals to confront the specific phobia. Research shows some benefits for specific phobias with applied relaxation. Relaxation training includes abdominal breathing and muscle relaxation on a regular basis. Studies have indicated that applied muscle tension has been highly effective for individuals with blood type phobias who faint in that the treatment triggers an early response. When using applied tension, therapists request that patients tense their muscles several times. The repeated muscle tensing results in a temporary increase in blood pressure and prevents fainting when patients see blood. Similar to in vivo exposure, the gains from applied tension are maintained upon follow-up. Some alternative therapies include immersive virtual reality, hypnotherapy , eye-movement desensitization and reprocessing (EMDR), and energy balance approaches such as massage and acupuncture . If specific phobias exist in adolescence, they have a greater chance of persisting in early adulthood. Specific phobias that continue into adulthood generally become chronic if they are not treated. Furthermore, there is a greater chance for an individual diagnosed with specific phobia to develop new phobias as a young adult. Phobias contracted during childhood or adolescence that continue when individuals become young adults remit approximately 20% of the time. Individuals with specific phobias do not often seek treatment. For those who seek treatment, research suggests that compared to individuals with specific phobias whose fear diminishes slowly during exposure, individuals with specific phobias whose fear diminishes more rapidly have a better prognosis for recovery. A consideration of prognosis takes into account the distinction between fear onset and phobia onset. Studies indicate that individuals with specific phobias of animal, blood, heights, and driving had a fear onset nine years earlier than their phobia onset. Some studies have shown that generalized anxiety level, severity of symptoms, and prior experience with the phobic stimulus are factors that have been associated with treatment outcome. Although most mental health professionals consider specific phobia that begins in childhood to be a benign disorder, it can last for years if left untreated. Some studies indicate, however, that specific phobia does not become worse and usually diminishes as an individual ages. Without treatment, the prognosis is poor for an individual who has several phobias. Early detection is a key to assisting individuals with mild cases of specific phobia to seek treatment to prevent the development of full-blown cases of the disorder. Individuals who are at risk for developing specific phobia as well as individuals who already have been diagnosed with specific phobia need to avoid caffeine because caffeine can increase arousal. Further research is needed to discover variables that predict the reason that only certain individuals will develop specific phobias after conditioning or acquiring information that leads to fear. Antony, Martin, M., Ph.D., and David H. Barlow, Ph.D. "Social Phobia, Specific Phobia." In Psychiatry. Volume 2. Edited by Allan Tasman, M.D., Jerald Kay, M.D., and Jeffrey A. Lieberman, M.D. Philadelphia: W. B. Saunders Company, 1997. Antony, Martin, M., Ph.D., and Richard P. Swinson. Phobic Disorders and Panic in Adults: A Guide to Assessment and Treatment. Washington, DC: American Psychological Association, 2000. Bourne, Edmund J., Ph.D. The Anxiety and Phobia Workbook. 3rd Edition. Oakland, CA: New Harbinger Publications,2001. Bourne, Edmund J., Ph.D. Beyond Anxiety and Phobia: A Step-by-Step Guide to Lifetime Recovery. Oakland, CA: New Harbinger Publications, 2001. Donahue, Brad, and James Johnston. "Specific Phobia." In Diagnosis, Conceptualization, and Treatment Planning for Adults: A Step-by-Step Guide, edited by Michel Hersen and Linda K. Porzelius. Mahwah, New Jersey: Lawrence Erlbaum Associates, Publishers, 2002. Elkin, David, M.D., and Cameron S. Carter, M.D. "Anxiety Disorders." In Introduction to Clinical Psychiatry, edited by G. David Elkin, M.D. 1st edition. Stamford, Connecticut: Appleton and Lange, 1999. Mager, Ralph, Alex H. Bullinger, Franz Mueller-Spahn, Marcus F. Kuntze, and Robert Stoermer. "Real-Time Monitoring of Brain Activity in Patients with Specific Phobia during Exposure Therapy, Employing a Stereoscopic Virtual Environment." CyberPsychology and Behavior 4, no. 4 (2001): 465–469. American Psychological Association. 750 First Street NE, Washington, D.C. 20002-4242. (202) 336-5500. <http://www.apa.org> . Anxiety Disorders Association of America (ADAA). 11900 Parklawn Drive, Suite 100, Rockville, MD. 20852-2624. (301) 231-9350. <http://www.adaa.org> . Phobics Anonymous. P.O. Box 1180, Palm Springs, CA. 92213. (760) 322-COPE.